Around this time of the year, I get very excited to see and smell those subtle hints of the budding life growing around me. I know that these subtleties will soon become a beautiful landscape fit for an artist’s palette full of colors often too vivid to imagine. I believe that flowers really are one of the few things in this world that embody all four of the inspirations for the Mindful Shopper; beauty, joy, comfort, and inspiration. 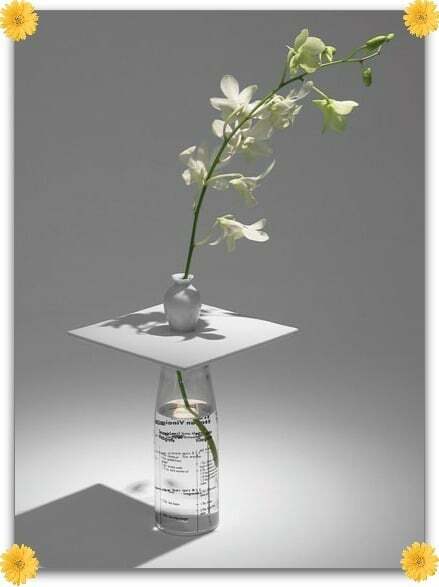 Though a flower is lovely enough to “stand on its own”, what fun to accompany that beautiful flower with an equally beautiful vase. 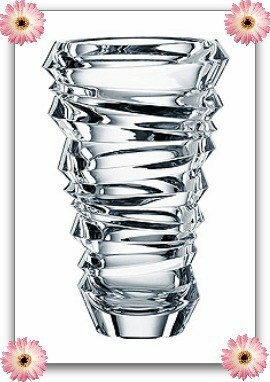 (1) This cool Wonder Vase (sold out) can be hand-formed into any shape you want when filled with warm water (empty and refill with cold water to set the form to make a sturdy, watertight vase). This thermal-sensitive polymer vase comes in blue and crystal clear colors. This would be a fun gift for “the kids” to give Mom for Mother’s Day. They would surely have a fun time making Mom a personally created vase. 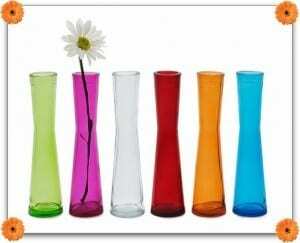 (2) These hand-blown, recycled glass Jewel Vases ($45, set of six) come in a set of six vibrant colors: lime, fuchsia, clear, red, orange, and blue. They can be displayed as a set or consider “spreading the joy” and giving each of your cherished friends a vase so that you all have your own beautiful vase to showcase your favorite blooms. (3) These Chica Wall Vases ($12.95 each, on sale for $9.95 each, sold out) are hand-made of recycled glass in transparent orange, green, yellow, turquoise, and blue colors. 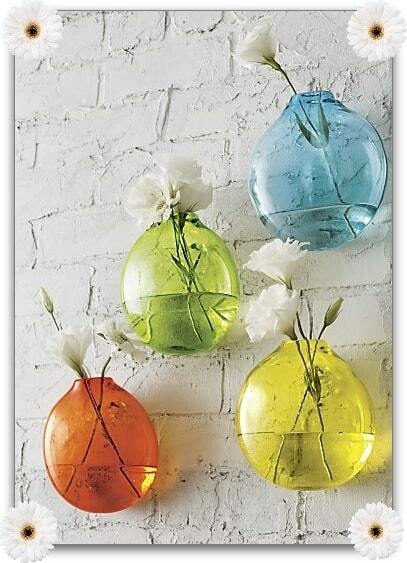 Hang one vase or a few to create a modern floral wall display. (4) Turn any vessel into a bud vase with the use of this Vase Maker ($34, on sale for $25.50). 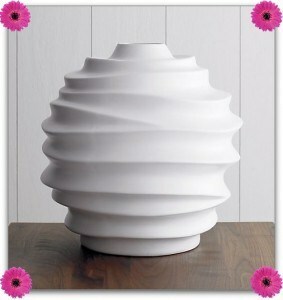 This fun porcelain vase is sure to get lots of second looks. 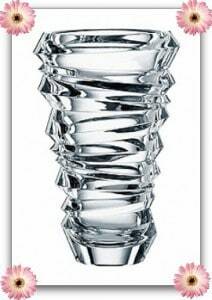 (5) This gorgeous Nachtmann Slice Vase ($125, on sale for $79.99) features a unique and contemporary spiral design that is sure to be a treasured item for any wedding couple. 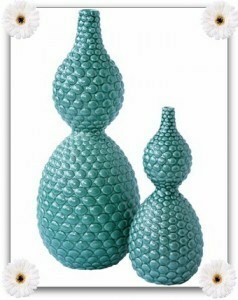 (6) These modern Bubble Vases ($40, on sale for $9.99 each, sold out) are a favorite of mine. How fun to be able to place these elegant hand-blown pieces of art around your home to surprise and delight your guests. (7) Bring some smiles with these Porcelain Can Vases ($54, set of three, sold out). 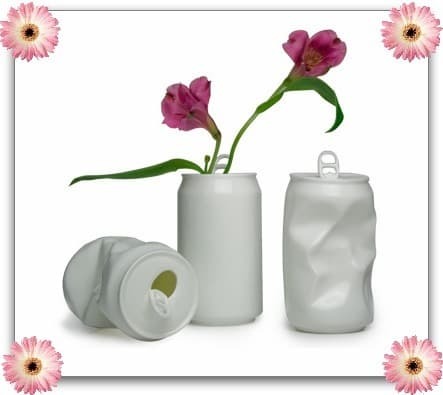 These whimsical vases come in a set of three “cans” that are skillfully cast in porcelain from whole and crushed cans. 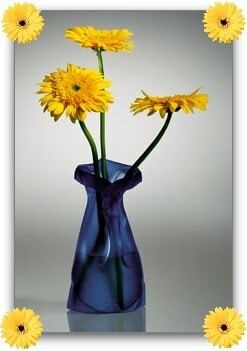 (8) These O Vases ($38-$48) are hand-made by Designer Kenneth Wingard. 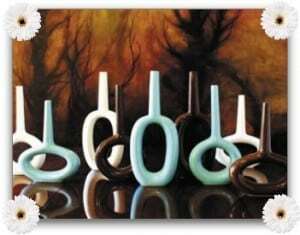 Each vase can be featured alone as a piece of art or can be grouped with others to make a great focal point in any room. 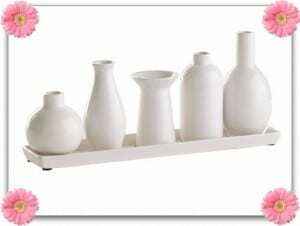 (9) There are five charming bud vases in this Many Silhouettes Bud Vases Ceramic Set (sold out). This set comes with a ceramic tray with a designated space for each vase. 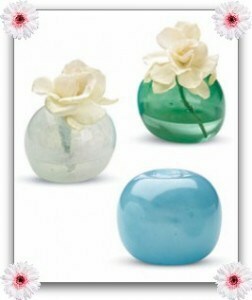 This set would look lovely on a wide windowsill or shelf in a kitchen or bedroom. (10) The retro chic design of these Pebble Double Bulb Vases ($63-$123) includes a raised pebble texture and hourglass silhouette that will make a stunning statement in your home. These vases come in a calming aqua blue color in a shade that is sure to be very popular this spring and summer. (11) This Spinner Vase ($89.95) is a hand-crafted stoneware vase made of freeform ridges that ripple to demonstrate subtle highlights and shadows. This is a captivating way to present a bouquet of colorful flowers in a sculptural form. Thank you for dropping by The Mindful Shopper! I absolutely LOVE it when you stop by! I hope you enjoyed my post all about Amazing Vases! Never realized that there are so many different types of vases, in so many fun shapes and colors. It was great checking these out. Keep up the great posts!!! love all the blooming going on here!